It took Apple Inc. all of 10 days to remind the tech world — still in the thrall of the iPad launch on April 3 — that it hasn’t taken its eye off the laptop business. While new iPad owners were wondering whether the Apple tablet would sound the death knell for laptops (and netbooks), Apple was putting the finishing touches on the next generation of its professional laptop line. On April 13, Apple delivered the goods, unveiling updated 13-, 15- and 17-in. MacBook Pros, the two larger models sporting fast Intel Core i5 or i7 processors and all three getting upgraded graphics chips and the prospect of longer battery life. In other words, the laptop is alive and well at Apple — and I say that as the owner of a new iPad, which I do think will change the way a lot of people use computers and access data and the Web. Virtually all of the changes rolled out last week are under the hood. (Take a look at iFixicom’s teardown if you really want to see under the hood of the new MacBook Pro.) The by-now-familiar unibody aluminum-and-glass look of the lineup is unchanged. Prices range from $1,199 for the 13-incher to $2,299 for the 17-in. version, though of course you can bump up the processor and add RAM — boosting the price in the process. That’s especially true if you spring for the optional 512GB solid-state drive (SSD), the largest SSD Apple has ever offered. That option alone adds between $1,300 and $1,450 to the baseline price (depending on which MacBook Pro you’re buying). But isn’t it nice to dream of all that SSD space? For review purposes, Apple sent over the basic 15-in. MacBook Pro, though there’s really nothing basic about it. For $1,799, you get a 2.4-GHz Core i5 processor from Intel, 4GB of RAM, integrated Intel HD graphics and a discrete Nvidia GeForce GT 330M graphics processor with 256MB of video RAM, a 320GB hard drive, a SuperDrive for burning and playing CDs and DVDs. It also has the usual retinue of ports and wireless connectivity and — probably most important for laptop lovers — a tweaked battery design that Apple says now offers up to nine hours of juice. Weight is unchanged at 5.6 pounds. The latest 15-in. 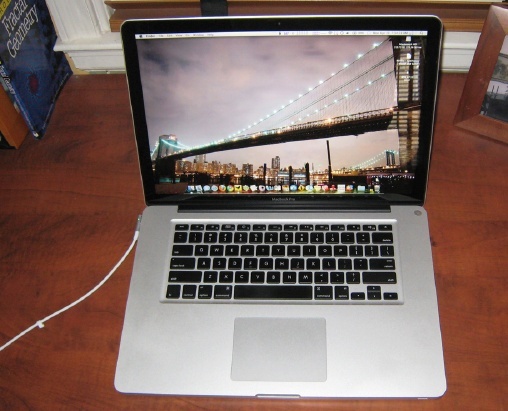 MacBook Pro is unchanged on the outside; inside, this one sports a 2.4-GHz Core i5 processor. Still not enough for you? For $200 more, you can opt for a 2.53-GHz Core i5 processor and a 500GB drive. Spend another $200, and you can move to the Core i7, which clocks in at 2.66 GHz and offers more video RAM (512MB). What’s noteworthy about this revamp — and what Apple officials most like to talk up — is that these laptops are not only faster at data-crunching because of those Core i5 and i7 chips, but they also offer substantially faster graphics — and do both of those things while delivering much improved battery life. My experience so far shows that Apple appears to have hit the mark all around. Before getting into the details about the 32nm Core i-series processors, I should point out that the 13-in. MacBook Pros still use Core 2 Duo chips. That’s because the Core i3 processor that a lot of Mac fans were hoping for — nay, expecting — didn’t fit the bill for the smallest MacBook Pro. According to Apple, using the Core i3 would have meant relying on the integrated Intel HD graphics subsystem. Instead, Apple went with the more powerful Nvidia GeForce 320M GPU and those Core 2 Duo processors (2.4 GHz in the $1,199 13-in. version, 2.66 GHz in the $1,499 model). Even with the newer Core 2 Duo processors and the beefy 320M GPU, Apple says the smallest MacBook Pro now gets up to 10 hours of battery life for ordinary tasks such as Web browsing over Wi-Fi. The company estimates that the larger 15-in. and 17-in. models get between eight and nine hours, depending on which of the two graphics systems you’re using. Unlike the smallest MacBook Pro, the 15-in. model has both the Intel HD integrated graphics for light use and a GeForce GT 330M for more intensive graphics work. If you’re surfing or writing a Word document, you’re using the Intel HD graphics; if you’re doing video work with Aperture or detailed jobs in Photoshop, you’re using the 330M. Here’s the catch, and it’s a good one: The laptop switches back and forth between the two without you having to do anything. That’s a change from the last generation of MacBook Pros, where you’d have to stop whatever you were doing when you needed more graphics power, log out and then log back in. Talk about stopping workflow in its tracks. The 330M, according to Apple, is about twice as fast as the Nvidia GPU in the 13-in. model, and about 20 per cent faster than the Nvidia 9600M GT used in the last MacBook Pro line. That’s something gamers should notice, because it allows for more details in graphically intense games. I’m not a gamer, though. When it comes to graphics, I judge how well a laptop plays back high-definition digital video: Are the colors rich and saturated? Is there any image “smearing” or obvious pixilation? 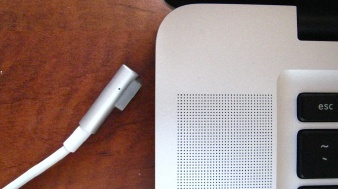 On those counts, the MacBook Pro’s sharp, LED-backlit screen looks great. In fact, I watched three back-to-back episodes of Mad Men at full-screen resolution with the brightness turned all the way up and they looked almost as good as they do on my hi-def TV at home. 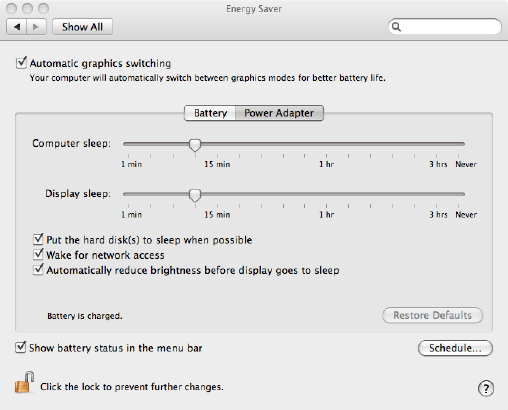 As for battery life, at first I didn’t see a major improvement over previous MacBook Pros. Apple says to expect 4.5 hours of use when watching DVDs full-screen at full brightness; I had to plug in the MacBook Pro after 3.5 hours of use. First, I set up the 15-in. MacBook Pro as I would normally, with the screen at about 80 per cent brightness. I also turned off some of Apple’s aggressive energy-saving settings in the Energy Saver preference pane, because I like to keep the screen from dimming on me if I turn away for a minute or two. While doing a combination of word processing, surfing the Web over Wi-Fi and listening to music through iTunes, the battery needed a recharge after 4.5 hours. To extend the battery life, I went back to the default settings in the Energy Saver preference pane. This dims the display a bit, darkens it completely after a couple of minutes of idle time and puts the hard drive to sleep when possible. That bumped the battery life to just over five hours. Finally, using the test account, I set the screen brightness at the halfway mark, surfed the Web, did some text editing and listened to streaming radio over iTunes. This time, I was able to use the MacBook Pro for just over 6.5 hours. That’s impressive, given that the new lineup has faster processors and better graphics chips. The lesson’s pretty clear: When you’re on the go, stick with the default Energy Saver settings and turn the screen brightness down. If you’re working in a dim locale or perhaps on the red-eye heading cross-country, turning the brightness way down and the Wi-Fi off will extend battery life even more. And if you find that your battery time is substantially less than you’d counted on, you might want to set up a new account and see if that helps. It did for me. All in all, Apple has delivered a laptop that’s more than just an evolutionary upgrade with unseen updates under the hood. It has moved its higher-end MacBook Pros closer to true quadcore speeds, while improving battery life and adding serious GPU performance. Given that the prices across the line are roughly the same as those of the last generation, depending on exactly which model you choose, that should be enough to make these laptops a sweet deal for anyone looking to upgrade. Me? I’m standing pat for now with the MacBook Pro I have; my new iPad should keep my techno-lust engaged for the time being. But it’s good to see that Apple hasn’t lost sight of the fact that the iPad, as phenomenal as it is, is but one of several options for would-be Mac buyers. For users who need the horsepower of a full-featured laptop, the latest MacBook Pro models should more than fit the bill, offering stylish construction, rock-solid design, long battery life and more than enough processing power to get them through any digital task.